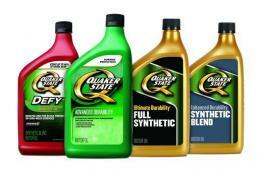 Energy Petroleum Company is proud to distribute Quaker State products. GM approved Quaker State® Ultimate Durability Full Synthetic 5W-30 Motor Oil is dexos1™ approved for use in all General Motors vehicles with gasoline engines. It provides unsurpassed protection against friction-related wear. Ultimate Durability Full Synthetic motor oil is Quaker State's best weapon against wear. No leading synthetic motor oil provides better protection from friction-related wear. Quaker State® GM dexos1 approved Synthetic Blend 5W-30 Motor Oil is approved for use in all GM vehicles with gasoline engines. Quaker State® Synthetic Blend 5W-30 Motor Oil is formulated to improve shear stability compared to conventional oil and provides excellent lubrication at high and low temperatures. Quaker State® Enhanced Durability Synthetic Blend coats your motor with a low-friction, heat-resistant film that reduces metal-to-metal contact when temperatures and stress levels are high. Quaker State Defy Motor Oil helps higher mileage engines defy time with increased zinc anti-wear agents that target high temperature and high-wear surfaces to help you get the most life out of your engine. Quaker State Advanced Durability motor oil minimizes friction-related wear 3x better than the wear standard set by top American and Japanese automotive manufacturers.